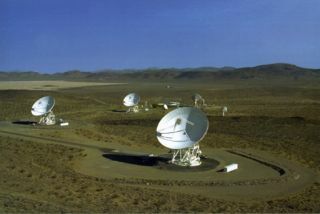 One of three complexes, the Goldstone Complex in the Mojave Desert is part of the Deep Space Network. In this historic 1990 photo from the U.S. space agency, seen situated in the Mojave Desert in California are three 34m (110 ft.) diameter Beam Waveguide antennas at the Goldstone Deep Space Communications Complex. This is one of three complexes which comprise NASA's Deep Space Network (DSN). The DSN provides radio communications for all of NASA's interplanetary spacecraft and is also utilized for radio astronomy and radar observations of the solar system and the universe.